Islander Scholars aren’t necessarily the highest academic achievers. They’re just good kids who define strong character. The idea sprang from a lunchtime meal over hamburger steak and saimin at a Zippy’s restaurant in 2014. Why, wondered Alapaki Nahale-a and Andrew Aoki — community members who are deeply involved in social and civic causes — do only kids who excel academically or on achievement tests get recognized within the education system? The U.S. Presidential Scholars Program came to mind. That’s the prestigious, highly selective federal program that recognizes students who score exceptionally well on the SAT or ACT, have high GPAs and demonstrate stellar performance in extracurriculars. 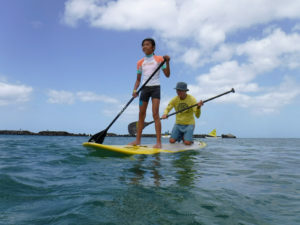 “Not every kid can be that kid,” Aoki, co-founder of Islander Institute, a civic enterprise focused on spreading values of Hawaii’s unique culture, told Civil Beat. 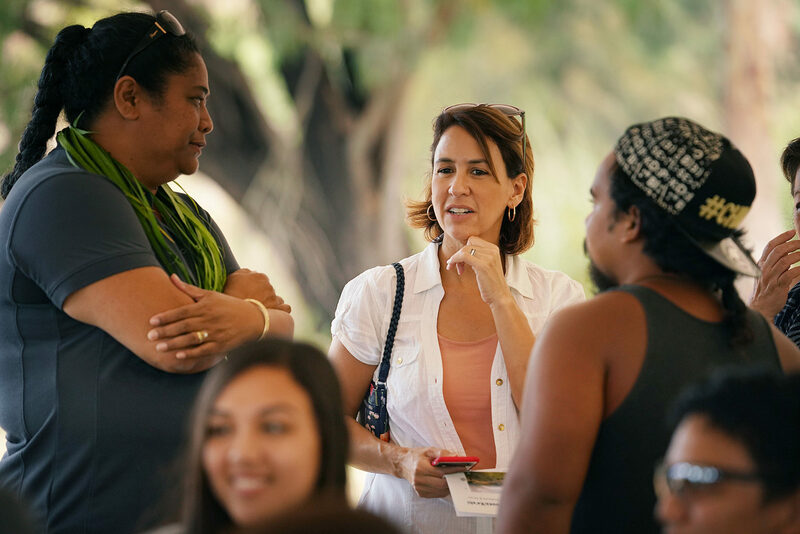 Thus was born the idea for Islander Scholars, which brings together a select group of high school juniors from public and charter schools statewide for a three-day immersive experience in the foothills of west Oahu to practice and share the values of culture, community and sense of place. Students gather around a tent at Camp Palehua during a ceremony on Sunday honoring 2018 Islander Scholars. Open to all public high school juniors, the students are nominated by their high school principal or counselor. Though some are academic standouts with aspirations to go to college and beyond, the only “merit-based” criteria here is leadership, resilience in the face of personal challenges or serving as a role model. 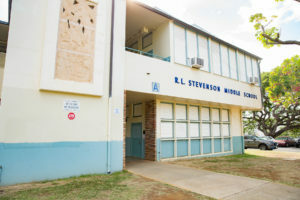 Now in its third year, Islander Scholars aligns with a framework the Hawaii Department of Education has been phasing into schools since it was adopted by the Board of Education in 2015. It’s called Na Hopena A’o, or HA for short. Rooted in the values of Hawaii’s indigenous culture and language, HA reflects a shift from the testing and achievement-driven focus of Common Core and No Child Left Behind to outcomes that emphasize the learning environment, collective engagement and multiculturalism through place- and project-based learning. The DOE is approaching year three of a pilot program to weave HA into Hawaii’s network of 292 schools where a large portion of the teacher population is still weathering top-down, achievement-focused outcomes. It may require a shift in mindset, but proponents believe the paradigm will ultimately benefit kids in Hawaii. DOE Superintendent Christina Kishimoto, center, attended Sunday’s ceremony at Camp Palehua. 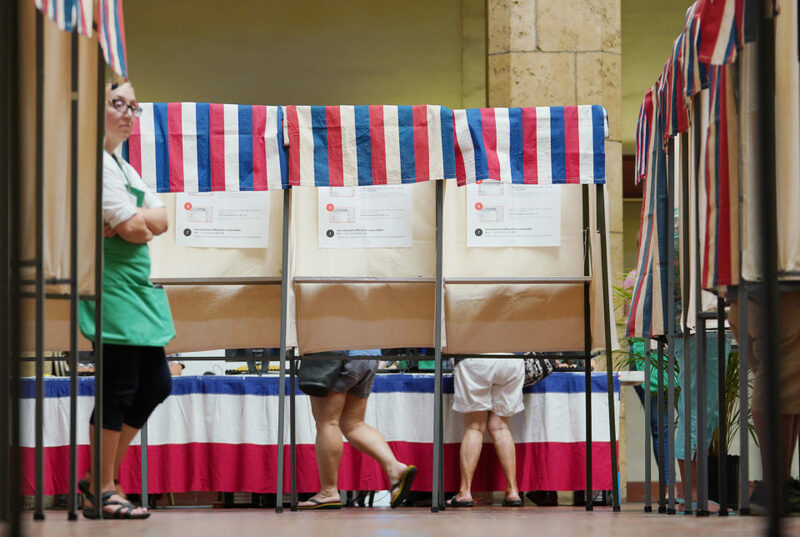 On paper, Hawaii is signaling its intention to do just that. 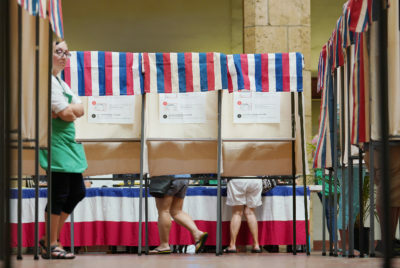 Hawaii’s Blueprint for Public Education — attached to its state plan under the Every Student Succeeds Act, which replaced No Child Left Behind — expresses a desire to move away from a focus on standardized tests and toward more authentic assessments. Many schools already take part in project-based learning, whether that’s through river restoration cleanups or cultivating school farms, according to Worchel. Newer initiatives like the DOE’s Farm to School meals program and a “Grow Our Own” initiative to groom homegrown teachers also reflect HA. The framework is also showing up in subtle ways in the school environment, she said. “It’s a leap of faith to say, ‘I’m gonna step outside this treadmill for a while and I’m going to focus on building relationships,’” Worchel said. 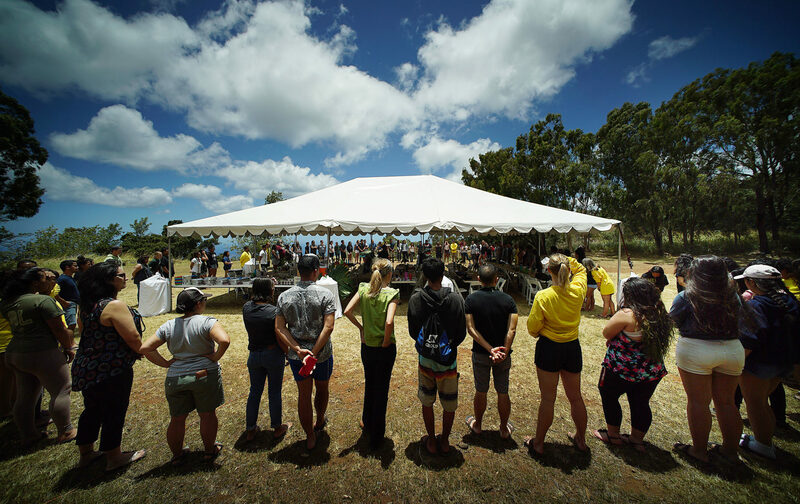 The latest class of Islander Scholars gathered last weekend at Camp Palehua in Kapolei to celebrate their connection to Hawaii and contributions to their community. They were 38 students — 17- and 18-year-olds from different cultures, socioeconomic backgrounds and family origins — from throughout the state. 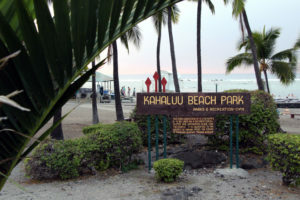 They hiked the nearby Waianae-Nanakuli mountain range, worked on plant restoration, visited the fishing village Mokauea Island and shared stories in small groups about the challenges of high school life, of being a teen. Recognition came in the form of short tributes during a Sunday capstone luncheon attended by prior Islander Scholars from the 2016 and 2017 academies. 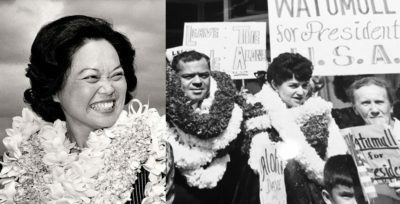 The current participants were presented with necklaces and showered with grass lei. In a large white tent under a brilliant blue sky, they were served a buffet lunch of traditional Hawaiian dishes of kalua pig, lomi salmon, poi, chicken long rice and haupia. The all-expenses-paid program is run by Islander Institute and Malama Learning Center. Funding comes from Kamehameha Schools, Alaska Airlines, Harold K.L. 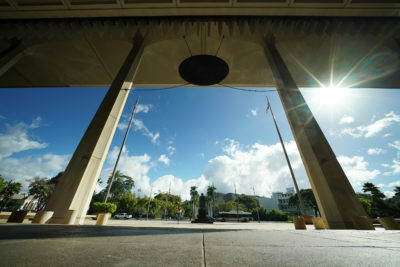 Castle Foundation, Hawaii Government Employees Association, Honuʻapo, Hawaii State Teachers Association, HEI Charitable Foundation and Na Lei Aloha Foundation. Programming partners include HMSA Foundation, The Kohala Center and Kokua Kalihi Valley. 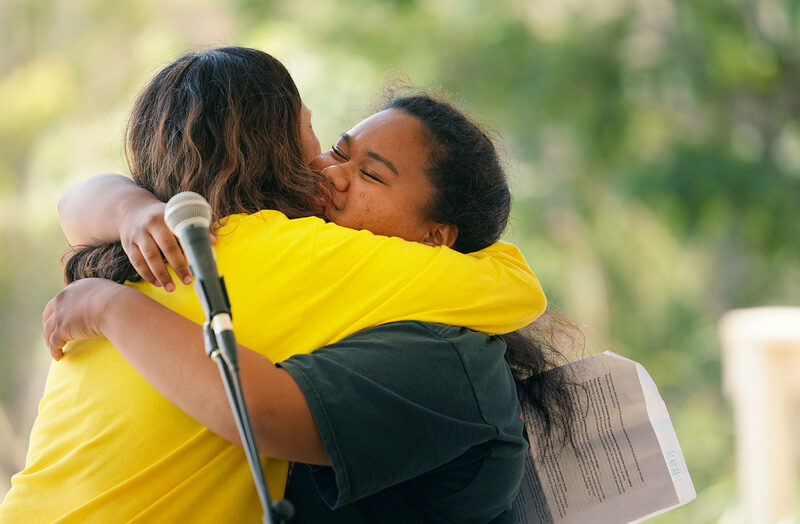 Zerasha-Rashan Carden, right, 18, from Kua O Ka La Public Charter School on Hawaii Island gets her award and a hug at the conclusion of the three-day camp. Students arrived Friday on the sloping campsite, after the last calendar day of the school year, not knowing each other. Many left Sunday having forged what may prove to be long-lasting friendships. 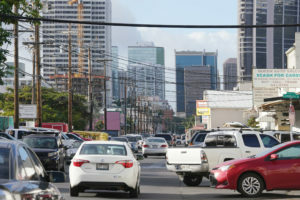 Others spoke about experiencing a sort of self-awakening when it comes to fitting into a place when they’re not originally from Hawaii. She moved to Hawaii from Michigan with family two years ago. Miller admitted to feeling like “an outsider” when she arrived on the island. As for her puncturing that mentality: “I think it’s all the person you are,” she said. Seated beside her, D’Artagnan Kunishige, of Honoka’a High and Intermediate School on the Big Island, nodded. Born and raised in Hawaii, the teen, who is of mixed Hawaiian, Chinese, Japanese and Portuguese descent, chimed in with his take. 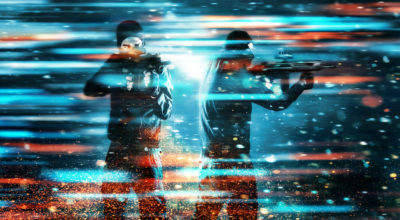 “In reality, they’re friendly over here,” he said. Madailein Miller, 17, of Castle High School, gets a hug from camp alumnus Rene Hutchins, left, a 2018 graduate of Castle, during the ceremony. 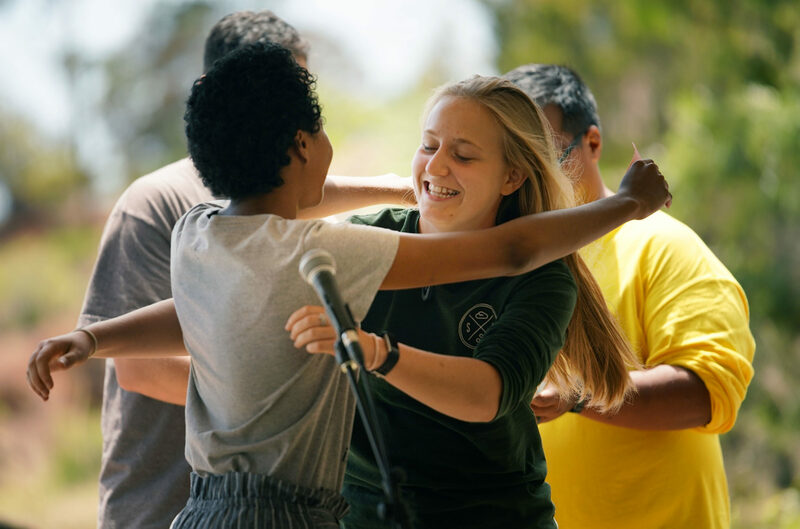 Some may say HA helps promote a more inclusive school climate and that Islander Scholars recognizes students who practice a culture of acceptance. One of the state Board of Education’s priorities for the upcoming school year is shaping policy to foster safe learning environments and reduce bullying. As brief as the Islander Scholars Academy is, past scholars said they have remained in touch through channels like Instagram and Snapchat group chats.